This is the unique auteur mind of Paul Thomas Anderson (“The Master,” “Inherent Vice”) and the way he approaches his film topics is mind altering. It’s always fascinating to try and interpret his often anti-hero films, and they always fall into one category… The Films of Paul Thomas Anderson. 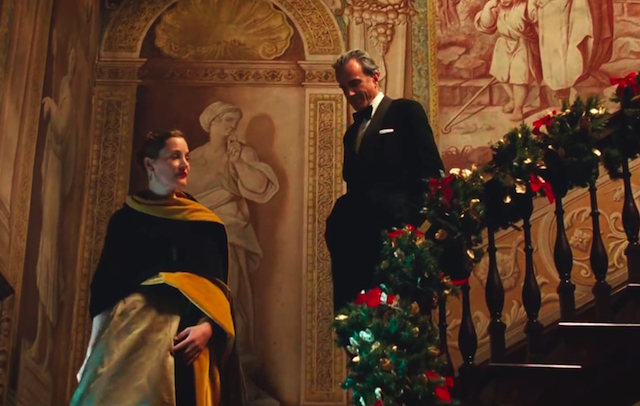 “Phantom Thread” is an obsessive movie, about the machinations of a fictional designer of fashion (portrayed by Daniel Day-Lewis, in what he is saying is his final on-screen role) in post-war 1950s London. The centerpiece of his adventure is about a relationship with a woman who he cannot live without, despite being characterized as somewhat asexual and with a healthy disregard for other people in general. That relationship forms the basis of the story, but it is both unwieldy and unsatisfying. Surrounding this lack-of-function couple is a beautiful world of fashion form (photographed by Anderson himself). As a film, it is a particular and peculiar experience, but as an insight isn’t as successful. The House of Woodcock is iconic fashion in 1950s London, run by the fussbudget compulsion of designer Reynolds Woodcock (Day-Lewis) and his sister Cyril (Lesley Manville). His career is ebbing, as fashions are starting to change, and in the midst of this change he meets a waitress named Alma (Vicky Krieps). His attention is momentarily distracted, and they begin a relationship. The relationship becomes based in a cat-and-mouse game between the two, as they claw at each other’s psyche. Essentially Woodcock dismisses the otherness of Alma, and eventually Alma begins to understand how to manipulate Woodcock. This is lathered, rinsed and repeated throughout the story of the film, providing for both of them significant life lessons. A film that is set in the world of fashion would hopefully have a sense of style, and Paul Thomas Anderson delivers that sense in a whirl of unique scene settings (and the film is available in 70mm, if you have that availability). The atmosphere is exquisite, like the delicacy of fine fabric, and even the players have a certain presence that contribute to the finery. Costuming, production design and cinematography are the stars of the picture, and in this case becomes more vital than the story… the film’s prettiness overindulges its vague morality. Daniel Day-Lewis has announced that this character will be his final movie role, and I couldn’t help but think I wish he would continue, and go out with a role that was less contradictory. But also this was typical of a “Day-Lewis” performance, full of contortions and tics that only can flow through his instrument. His Reynolds Woodcock is somewhat repulsive, with a demanding quality to his fashion design that is so off-putting that it almost deserves to go out of style. That strong reaction to the film’s context does speak intuitively for the talent of Day-Lewis. More interesting was his equal in the film, interpreted by newcomer Vicky Krieps as Alma. There is a certain mercenary quality to her working class girl, as she experiences an opportunity for uplifting her life’s station, but there is more to that quality than its surface. This is a woman who would never have an opportunity for psychological games in her other life, and finds she is good at it, and that rewards her in other ways. Lesley Manville as sister Cyril is also fascinating… she becomes a surprising bridge between Alma and Woodcock. This film has been lauded elsewhere, as critics jump over each other to praise the story of this off-putting couple. I suspect this will be a divisive film, as the centerpiece relationship is a frustrating single note of two people manipulating each other. Perhaps that is the eventual truth of all relationships, but it’s not something that is thought provoking or entertaining.